We are excited to share that we participated in the production of a new Kawasaki supersport bike commercial this week. Filmed on back stretch of Irvine Lake, the commercial is set on an outdoor wedding and fittingly we provided the wedding cake. Two identical cakes to be exact, one for each day of filming. Rumor is they may be crashing/jumping through one of the cakes, how cool is that!! We’ll have to wait and see what makes the cut. We’ll be sure to post the video for all to see once the commercial airs. 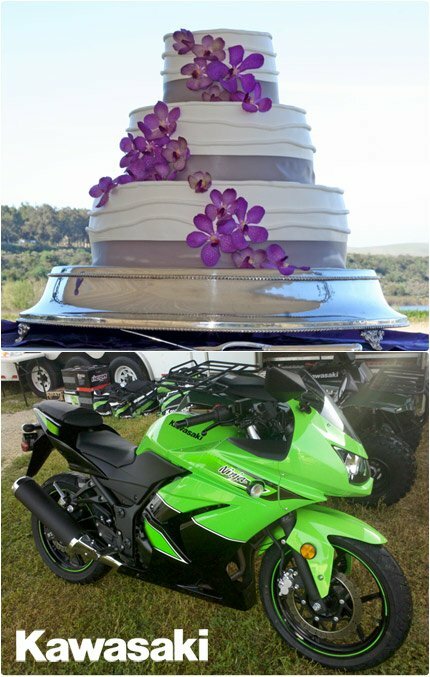 Below you’ll see a picture of the cake and the “Ninja” supersport bike featured. Our friends at Flower Allie in Fullerton also joined in and provided the fantastic flowers. 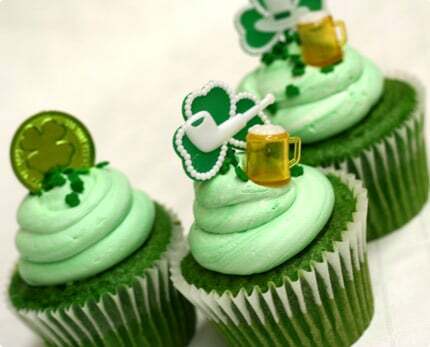 Come get your delicious green velvet St. Patrick’s Day cupcakes today. ‎Patty’s Cakes and Dessert’s has the best Cupcakes in town… if you’re ever in Fullerton I totally rececommend you stop by… they are sooooo yummy and totally worth the trip!